Cape Town - Spare a thought for Heinrich Klaasen. Given the first two ODIs against Pakistan and a platform to stake a claim for a World Cup spot later this year, the wicketkeeper/batsman did not get to the crease in the first ODI in Port Elizabeth and was out for a first ball duck in the second in Durban on Tuesday night. It couldn't have gone worse for him, and with Quinton de Kock expected to return for the remainder of the series, Klaasen can no longer be guaranteed of a game. His World Cup charge may very well be nearing its end, and much of that has to do with the form of Rassie van der Dussen. Where Klaasen has stuttered over the last year for an ODI average of 22.81 in 13 innings, Van der Dussen has hit the ground running. 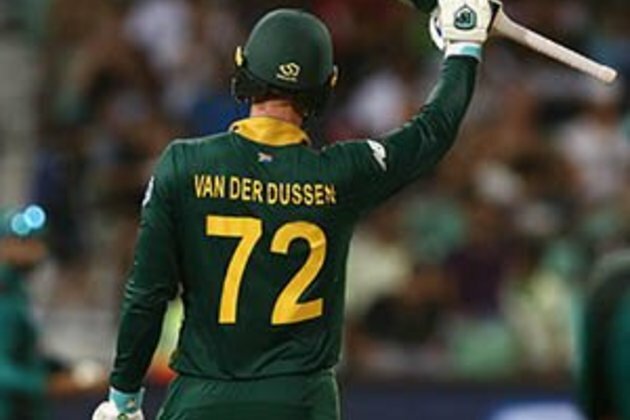 Debuting with 93 (101) on Saturday and then winning the 2nd ODI with a sublime 80* (123) on Tuesday, Van der Dussen is absolutely smashing the World Cup door down. Form aside, it is the fact that he gives South Africa an option at No 3 that is perhaps most pleasing. Klaasen has batted at No 4, No 5 and No 6 in his short ODI career so far, but not at No 3 in the only position of real uncertainty in the Proteas top order currently. Hashim Amla and De Kock will open the batting in England, skipper Faf du Plessis will come in at No 4 while JP Duminy and David Miller are expected to bat at No 5 and No 6, respectively. Presuming that an allrounder is backed at No 7, that leaves the No 3 slot available and Klaasen just doesn't seem anywhere near the top of the pecking order right now. Instead, Van der Dussen, Reeza Hendricks and Aiden Markram are engaged in that battle. Hendricks is getting game time at the top of the order in De Kock's absence, but he has failed to kick on from the century he scored on debut against Sri Lanka back in August last year, going past 50 just once since then in 10 knocks. Markram, too, has not capitalised on his opportunities when they have come around, and with just eight ODIs left between now and the World Cup, there may not be many more. Van der Dussen is peaking at precisely the right time. He may be in the infancy of his international career, but at 29 Van der Dussen has vast experience at provincial level and has played in high-pressure situations numerous times. He looks a player who understands his game incredibly well, and he proved on Tuesday night by playing the situation perfectly. Van der Dussen batted for nearly three hours and was the cool head needed when wickets were tumbling around him. It was a mature innings and one that will go a long way towards getting him on the plane to the World Cup. Finishing as the leading run-scorer in the Mzansi Super League (MSL) last year, Van der Dussen showed in that tournament that he also possesses the muscle and shot-making to score quickly when he needs to. That versatility, as much as anything, works in his favour. There is still a long way to go and there will be many plot twists ahead, but early signs are that Van der Dussen has the ingredients to be backed in that all-important No 3 role. These months leading up to a World Cup can be brutal, as Klaasen is currently finding out first-hand. A World Cup ticket is surely a long way off for him now. Rassie, though, has made his move.